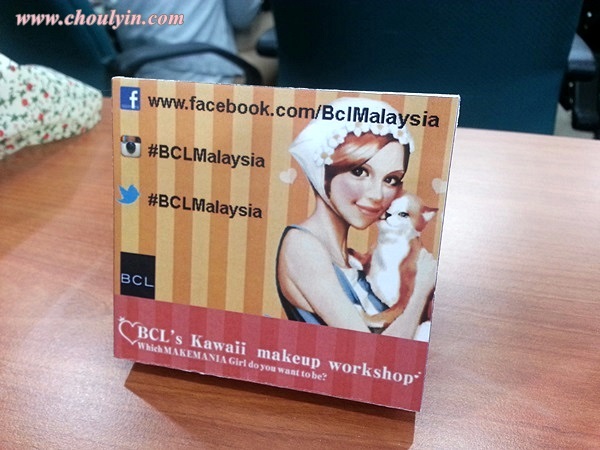 But even though I was sick, I was determined to head over to Mandom's office for the exclusive BCL Kawaii Make Up Workshop organised for us by the wonderful folks at Mandom and Manoah! They had specially flew in a Make Up Artist from Japan, who has had over 10 years of experience in the beauty industry making up celebrities and giving out workshops! It was a day filled with fun and entertainment with the Japanese folks around, it almost seemed like we were watching a live drama show! Before we started the session, our MUA, Mr. Tanabe prepped our model's face with a make up base and loose powder while the rest of us bloggers snapped away at the array of products available on our table. We were very busy bees for that particular 15 minutes! 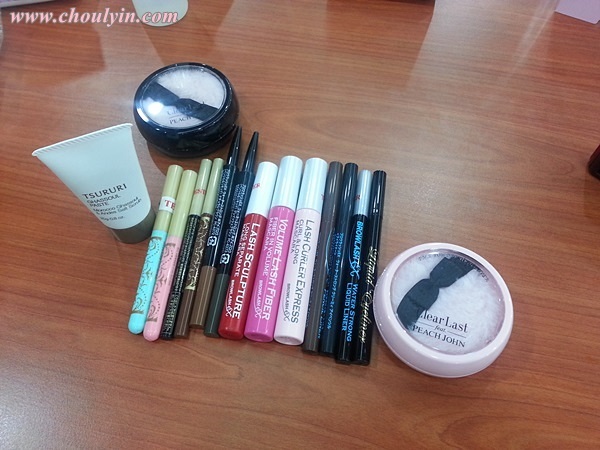 First up, we were encouraged to try their Clear Last Face Powder, featuring Peach John. I love the packaging very much, it really looks very feminine! There are two colour ranges for this particular product, which is Mat Ocher (pink) and Shiro-Hada Ocher (black). The Pink one has a more matte finish and has a darker colour for dark skin tones. Those with fair skin tones can opt to use the Shiro-Hada Ocher, which also has a more shimmery finish. I so love the puff. It's so furry and wooly, kinda reminds me of a wooly mammoth :p lol don't ask me how that came into my head. After the face powder the next product is the Browlash EX Water Strong Eyebrow. It comes in two colours, Natural Brown (top) and Grayish Brown (bottom). Usually for eyebrows, I don't find many cosmetic brands out there carrying black brow liners. Mainly because your eyebrows should be a shade lighter than your hair, so there will not be any brand that will have black brow pencils. Grayish black maybe, but not black. There are two types of applicators on the stick, which are liquid and pencil. The swatch doesn't look that noticeable here, maybe cos it's still new, so it needed a little bit of time to break in. The top line is the Natural Brown, liquid and pencil type. The second line is Grayish Brown, liquid and pencil. I tried on the Grayish Brown, cos I've always liked my brows to be a little darker so that they frame my face nicely. Furthermore, my hair colour is dark, so it suited me. So how to draw your brows beautifully? According to Mr. Tanabe, you should draw from the mountaintops to the outside before defining the 'uphill' slope in the inner part of your brows. lol I don't even know if that makes sense. Take for example, if you are drawing your right eyebrow, when you look into the mirror, your eyebrows should ideally be shaped like an upside down V. So you start from the top of the V, and draw down the right side first, before drawing down to the left. Do not draw in a long fluid movement, but slow and precise strokes so that you can slowly see the definition clearer. Oh and did I mention that it was a fun workshop? Our MUA actually went around the room helping some of us to draw our eyebrows. Next up, we have the eyeshadow, the Makemania Data Gradation Tip Shadow which comes in Bronze Brown (pink), and Light Brown (Green). Swatches of the two colours, top is Bronze Brown, and bottom is Light Brown. I like how the colours are shimmery, and not too dark or too light, perfect for everyday wear. Because these colours are in pencil form and are the creamy powdery type, you can easily bring it around in y our purse for a quick touchup without having to bring a separate brush. All you need to do is apply a little on the outer corners of your eyes and smudge it a little to give it the 3D effect and smokey look. To line our eyes, we have the Makemania Data Pencil Gel Eyeliner. The goodness of a gel liner, in pencil form! You will have to be careful when you twist the tip to get the gel liner out, as it is a non-retractable tip. So only screw up the amount that you need, and not more. The gel liner comes in two colours, Jet Black, and Deep Brown. I feel that I must say something about the gel liners. THEY ARE WATERPROOF. It's even hard to remove them with make up remover! After I did this swatch, I tried to remove it with the Bifesta remover that they provided, and it was so hard to remove! I showed Jolie my hand after I rubbed it off, there was a distinct red mark on my hand. It made me a little apprehensive to try it out cos I didn't want to rub my eyes raw to remove it,, but curiosity got the better of me. Now for the second step of lining our eyes. I know you must be wondering why must we use two eyeliners instead of one? As the girl that the MUA is demonstrating is the Cool and Confident girl, the look has to be classy and elegant, thus smokey eyes and dark liners are the trend for this look. Girls synonymous with this look has very distinct dark, sharp, and impressive liners. corners of the eyes and create the cat-eye effect to make your eyes stand out. Swatches on my hand. The top two are the pencil liners in brown, and black. The third line is the Browlash liquid liner (with the felt tip), and the last is the liquid liner (small precise tip). For beginners out there, I would suggest that you use the felt tip liner first, before trying your hand at the small precise tip liner. As a finishing touch to the eyes, it is time to create the curtains for your windows (to the soul). For the Shibuya lady, lashes are what creates the cool and confident effect. So we start of with the Volume Lash Fibre, Lash Curler Express, and finish with the Lash Sculpture. The Volume Lash Fibre has the ability to create 200% more volume to your lashes, making them fuller and more prominent. Check out those mini fibres on the mascara wand. Lastly, the Lash Sculpture, which has a comb-like wand, capable of separating your lashes, enabling them to look fuller and not clumped together. Mr. Tanabe showed us how it's done on Yeeing, and you can definitely see the difference in the before (bottom) and after (top) pictures. I'm not kidding, it really smells like strawberries and tastes like one too! 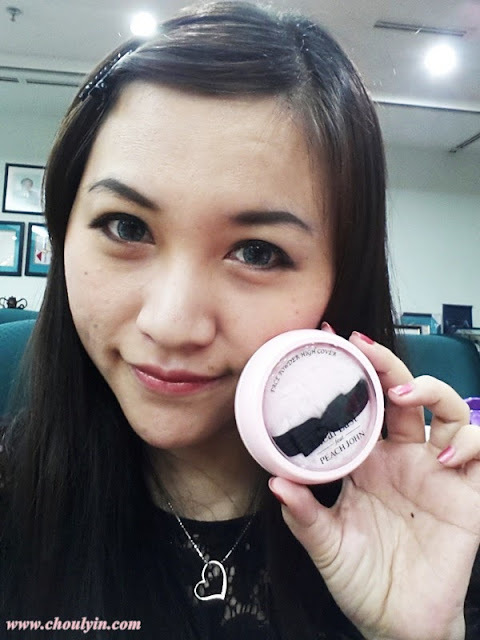 Another sample we got to try was the PureGlam Blush, also not available in Malaysia at the moment. In the palette itself, there are four colours. So how you use the blush is to mix all the colours together to get a harmonious blend of colours, after which you dust off the excess and apply on the apples of your cheeks. To highlight your nose, use the two lightest colours. and voila! 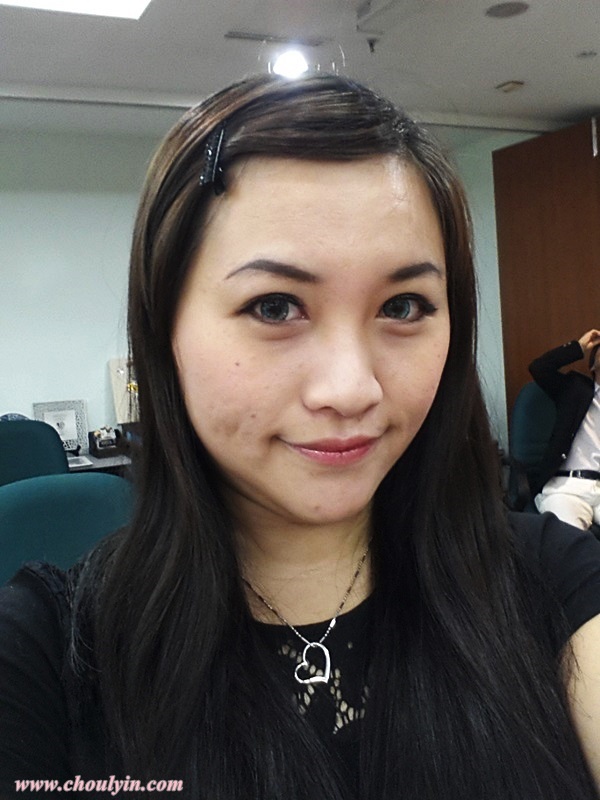 this is how I look like over the make over :) Different much? After a long and tiring day with make up on, the Tsururi Ghassoul Paste Salt Scrub comes to the rescue! The beads in the scrub are gentle enough for you to use everyday (for oily prone skin), or every week (sensitive skin). You can use it as a double cleanser after you remove your make up, or you can use it as a make up remover to remove simple and natural make up. Before we all left for the day, we had to take the customary group picture :) It was a pretty small group that morning, but it was fun getting to know the other bloggers and engaging with the MUA more personally. Do keep a lookout for the BCL booths in SaSa stores near you! The colour of the scrub is so special!